Tag-Archive for "XM Royal 10 Year Old Rum"
In remembrance of the demise of over 300 years of Royal Naval tradition, London’s Vinopolis played host to a full house for the Black Tot Last Consignment Rum tasting. 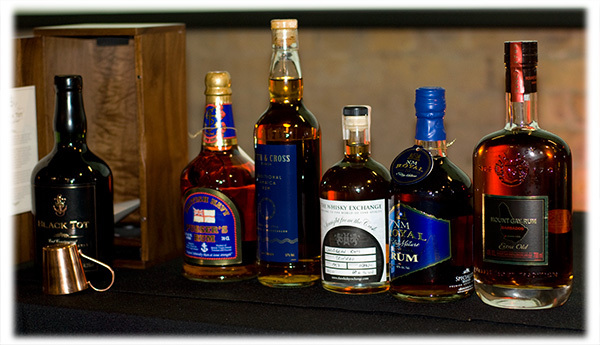 Organised by The Whisky Exchange, for the 2nd August 2011, to mark the 41st anniversary of Black Tot day, this rum tasting gave those present the opportunity to try a number of representative Caribbean rums, as well as Pusser’s Rum and of course Black Tot Last Consignment Rum. After the Caribbean island of Jamaica was captured from the Spanish in 1655 by the British fleet, the history of rum became entwined with that of the Royal Navy. With access to Jamaica’s sugar cane production also came rum and it didn’t take long for rum to replace the sailor’s daily ration of beer. As onboard water casks would often become stagnant and contaminated, sailors were issued a gallon* of beer every day. With Jamaica’s capture in 1655, rum slowly became more common place as the daily ration, until in 1731 a 1/2 pint* a day had become the regulation issue. By 1740, Vice-Admiral Edward Vernon reduced the daily rum ration further, which was served twice daily mixed with water and citrus juice, which came to be known as “grog”. Supposedly named grog after the Vice-Admiral’s nickname of “Old Grog”, which was attributed to his habit of wearing a cloak of grogram cloth. Although it wasn’t confirmed for several more years, the practice of adding citrus juice to the daily ration improved the health of the sailors under Vernon’s command and reduced the effects of scurvy. Over the next 230 years the daily ration was further reduced in quantity, but more importantly, it was also improved in quality. By the time of the Second World War, the British Royal Navy rum was a blend of rums from several distilleries in the Caribbean and used a 32 vat solera process, housed in London. Mixing old and new rums, it is believed that some of the rums from the final blend would have been as old as 50 years. When the last “Up Spirits” was heard throughout the British Royal Navy on the 31st July 1970, the daily ration, by now known as a tot, was an eighth of an imperial pint of 54.5% ABV / 109 Proof rum, mixed 2:1 with water. In recognition of the end of the long standing tradition of rum and the Royal Navy, that day was marked down in history as Black Tot Day. Following Black Tot Day, the Royal Navy’s rum solera was emptied and all of the remaining rum stocks were stored in one gallon (imperial) stone flagons, under government bond in the following Royal Naval Victualling Yards; the Royal Victoria in Deptford, the Royal Clarence in Gosport and the Royal William in Plymouth. With the exception of use for State occasions and Royal weddings these flagons remained untouched for nearly forty years, before being purchased and released in 2010 as Black Tot Last Consignment Rum. With a brief but informative history of the Royal Navy’s association with rum covered, Declan moved on to the rum tasting. The Royal Navy blend of rum was known to have been principally imported from the Caribbean islands of Barbados, Jamaica and Trinidad, as well as the British South American colony of Guyana. As such, the evening’s tastings would be representative of these Caribbean rums and would be followed by both Pusser’s Navy Rum and Black Tot Last Consignment Rum. Mount Gay Extra Old Rum – Produced in Barbados by Mount Gay Rum, this rum is bottled at 40% ABV / 80 Proof. This smooth, oaky rum has a subtle caramel aroma with a slightly sharp after bite. XM Royal 10 Year Old Rum – Produced in Guyana by Banks DIH, this rum is bottled at 40% ABV / 80 Proof. One of the best rums of the evening, this rum has a sweet caramel nose, which comes through in its smooth taste. Trinidadian Live Cask Rum – Produced in Trinidad, this rum is bottled straight from the cask, at The Whisky Exchange, at 60.6% ABV / 121.2 Proof. Still being aged in the barrel, the taste profile of this live cask rum will continue to change but at time of tasting it had a smoky and spicy aroma, with a spicy, dry, oaky flavour. Smith & Cross Rum – Produced in Jamaica, this rum is bottled at 57% ABV / 114 Proof. A blend of aged distillates from both Wedderburn and Plummer pot stills in Jamaica, this sweet fruity rum is smooth, with a slightly spicy finish. Pusser’s Navy Rum – A blend of Caribbean rums from the Royal Naval rum blend, this rum is bottled at 54.5% ABV / 109 Proof. Produced in the British Virgin Islands, this navy rum is easy to drink despite its strong alcohol content. With a slightly sweet liquorice start and a dryer oaky finish, this is an excellent sipping rum. In preparation of tasting the main rum of the evening, Declan handed the presentation reigns to Nick Tilt, one of the co-creators of Black Tot Last Consignment rum. 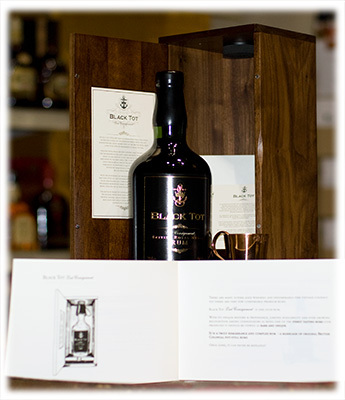 Before raising our glasses to a traditional toast, Nick explained that the 6,000 declared bottles of Black Tot Last Consignment rum are a blend of the Royal Navy rums from the three Royal Navy Victualling Yards and that during the nearly forty years in storage the rum had only lost 0.2% of its ABV. 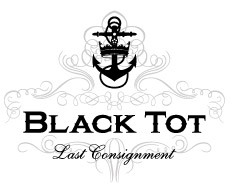 Black Tot Last Consignment Rum – A blend of the last remaining stocks of Royal Navy Rum, this rum is bottled at 54.3% ABV / 108.6 Proof. Steeped in all those years of history, you can’t help but approach this rum with respect and it’s a respect that it deserves. Where Pusser’s has captured a glimpse of what the Royal Navy rum was like, it simply cannot compete with the full bodied character of a spirit that contains rum that would have been distilled during the Second World War. With a sweet caramel nose and a smoky, spicy taste this rum is simply superb. With the evening over and an another excellent rum tasting held at Vinopolis finished, I was left to wonder what’s next and what they’ll do for next year’s Black Tot Day? Although there are no current plans for anymore Whisky Exchange rum tastings this year, I will be keeping an ear out and will post news of any update when it’s confirmed. So my thanks to Declan McGurk of Speciality Brands, Nick Tilt and the Whisky Exchange team, for a great evening and the chance to try so many great rums, especially the very special Black Tot Last Consignment Rum. * It is worth noting that the pints and gallons referred to here would have been based on what has today become known as a US Pint (0.473 litre) and US Gallon (3.785 litres). Imperial pints and gallons were not introduced in Britain until 1824 and equate to 0.568 litre and 4.546 litres respectively.